Ready or not, spring is bearing down on us and we are getting busy in the greenhouse getting our seeds started! Seed starting is my favorite thing to do on the farm after weeding (seriously, I love to weed more than anything else in the world!) so I tend to get pretty excited this time of year. So far, this year has felt a bit odd since it's been so warm outside. We are struggling to hold ourselves back and not start too much too early! We are getting going earlier this year than in the past since we are switching our onion production from using plant starts (bought off farm) to growing all of our own onion plants. It's a big deal for us since it involves starting the greenhouse a week earlier and managing a LOT more flats in what's an already overcrowded greenhouse. We anticipate moving to expert level greenhouse-tetris this year since our greenhouse holds 252 flats of plants and during April, thanks to the onion experiment, we will have 380 flats that need a home. So cross your fingers for an early spring, or we will have to start finding innovative places to put some of those plants! In addition to onions, we have so far started shallots and scallions, early season leeks, and a slew of herbs (we are adding herbs to the CSA U-Pick garden this year!). This week, we start the first rounds of kale, chard, broccoli, long-season flowers, and more. We do a lot of seed starting in part because our growing season is short up here (we figure that we are frost safe from the last weekend of May to the third week of September, which gives us a conservative estimate of 115 frost free days. We plan on starting planting our sturdier crops by mid-April or whenever the ground thaws/spring monsoons stop (which last year, wasn't until the first week of May), and plan on harvesting from the fields the fall hardy crops until sometime between Halloween and Thanksgiving. Using started plants instead of direct seeding crops shaves off generally two weeks of valuable growing time. In addition, starting off with seedlings helps us stay ahead of weeds and pests by giving the plants a bit of a head start. Super improving the small heated greenhouse! This was one of last fall's lack of snow bonus projects, and involved replacing both end walls, adding roll-up sidewalls (so we can roll up the plastic covering and get some air in there when it starts to heat up), and replacing the old plastic with a new double layer of plastic. This last item is pretty neat--it uses a small blower to inflate the space between the two layers of plastic to create an air filled space for insulation. This allows us to use significantly less propane to keep the greenhouse warm and toasty. We have been amazed this winter at how much tighter and more efficient the greenhouse is! We are also playing around with low tech ways to increase humidity levels until the seeds germinate, which has been a problem for us in the past. We are using a lot of seed domes this year, which work so-so, and we built a totally silly little plastic germination chamber that doesn't add a ton of heat, but does help. 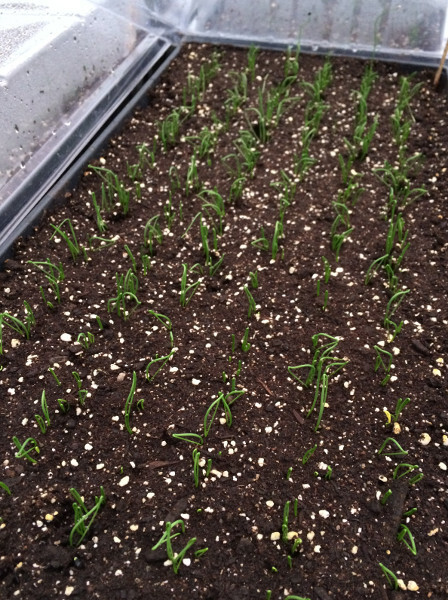 So far, it's halved our time to germination on our onions! Finally, we are building some new jigs this year to try and get faster holes or lines in our flats for seeding. These are called "dibblers" and basically just make uniform indentations for us to put seeds, so we can make sure everything is planted at the same, correct depth. We'll no doubt be posting lots of pictures as the greenhouse starts taking off, though now it's in the scary stage of being full of thousands of plants that mostly haven't started growing. Even though I know they will grow (because they always do), it always tests my faith a bit until we have a bit of green in there! If you are gardening at home, you can find nice seedlings at a lot of the farmers markets now, or you can try your hand at starting your own plants. We get a lot of questions about folks about growing seedlings every summer, so I wanted to finish off today with our top list of hints and recommendations on starting your own seeds at home! Try to start with good ingredients! Some seeds can germinate years after you buy them, but most seeds have a limited number of years where they stay viable. If you are using old or sketchy seed, you can either test the germination rates in advance (there's tons of you tube videos on how to do this), or you can seed really heavy and then thin out any extra crops with scissors later. We try to vigorously rotate and use up our seeds within a season or two, so that we always have vigorous growth. Potting soil also has a huge range. I know folks who have good luck with regular potting soil and others who make their own (there are lots of recipes online). We prefer a nice organic compost based soil for most crops. Yes, it's not a sterile environment so there is a tiny chance the compost based soil might have fungus or something that could infect the crops, but we really like how the compost potting soils create a situation more similar to field growing conditions, and have plenty of nutrients for the plant to use the whole time they are in the greenhouse. Get your soil moist before you put any seeds in it! This might seem odd, but many potting soils (especially the commercially sold ones) have things like peat moss in them, which are really great at holding water, but are really, really hard to get wet (they are hydro-phobic so they actually shed water). We mix all of our potting soil with water before filling the flats, so it starts off moist and we aren't struggling to get it wet while worrying about washing the seeds away. You don't want to go overboard and have it sloppy and too wet, but just nice and sticky and damp. Seeds need the perfect amount of water--too little and it's hard for them to germinate or break through the surface, and too much can lead to diseases that can kill the little guys. We generally do lots of misting and keep the trays super damp until the seed germinates, and then switch to watering deeply one or two times a day, letting the surface dry thoroughly before we water again. You don't want the trays to get too dry though--we actually lift them up a lot and use weight to gauge how moist they are. On a related note, watch out for "damping off," which is the most common issue we get asked about. Damping off is when it looks like your seedlings either keel over at the soil line, or are pinched off just above the soil somewhere on their stem. It comes from a soil borne disease that is spread by excessive moisture and over-watering. If you start to see some guys with it, move your tray to a place where it gets better airflow and watch that you aren't watering too much. We mentioned the germination domes before--we like to use these, but stop using them once the seedlings are up, since in our experience they can create conditions more favorable to damping off! Light is critical to seedlings! If you don't have a greenhouse, you can either start seeds on a bright windowsill, or use grow lights (or regular old florescents) in your house. The key for natural light is that it HAS to be good and consistent for most of the day. If you have your plants in a nice light room, but not in direct sunlight, they will get all "leggy," which is when their stems get elongated. If you baby along the leggy seedlings, they can survive, but won't ever thrive as much as non-leggy ones. If you use grow lights, make sure they are close enough to the plants. Close enough generally is 4 or 6 inches away--like super close! If they are too far, you can again get weaker, leggy plants. Timing is also really important in seed starting. We have an incredibly rigid schedule for our plants based on when we can get them in the ground at our farm and how long they take to grow as seedlings. This varies for every garden site and crop (you can find out this second component on most seed packets), so you will want to think about what works for your situation. For something like tomatoes that we plan on planting at the end of May, we wouldn't want to start them more than 5 or 6 weeks in advance, or in early to mid-April. You can definitely start them earlier if you use bigger pots or if you are able to get into your garden sooner, but you probably want to avoid the excitement of starting them in January! Starting things too early can lead to root bound plants, where they run out of space in their cells and their roots get all tangled up. Like leggy plants, this stresses seedlings out and sets them back in the garden. Finally, when you are all ready to plant your awesome seedlings into the garden, make sure you pick a good day and time to do so. Setting out plants is really stressful to them, since they are losing their cushy spot in your house or greenhouse. To soften this transition, we generally "harden off" our plants by exposing them slowly to more cold and dryness by moving them outside for periods of time some 3 or 4 days in advance or by reducing water. We also recommend planting on a cloudy day or in evening, when the sun isn't beating down, and watering the plants really well at planting and for the next few days. Hope these tips are helpful and you are able to enjoy some time in a greenhouse this spring!